Thirty years ago McLaren unveiled the first carbon fibre F1 car. The MP4/1 changed the way that racing teams thought about composite materials. Now the world's big carmakers are finally coming round to carbon fibre. John Watson didn't set out to be a human crash test dummy. But when his McLaren MP4/1 spun out of the 1981 Monza Grand Prix, he became an unwitting advert for a new automotive technology. "Lots of people in the paddock thought I was dead. I know people who watched on television and they cried," said Mr Watson. Image caption John Watson with the MP4/1. His crash at Monza in 1981 showed the strength of carbon fibre. Their grieving was unfounded. The young British driver climbed unhurt from motor racing's first carbon fibre monocoque cabin. "Had I had that accident in a conventional aluminium tub, I suspect I might have been injured because the strength of an aluminium tub is very much less than the carbon tub," he said. McLaren had recently turned to the man-made material in an attempt to strengthen and shed weight from its Formula 1 cars. At the time, the idea was radical, although carbon fibre technology had been around for several decades. The chemical company Union Carbide began experimenting with weaving thin strands of carbon molecules into fabric during the 1950s. Over the next decade, Britain took the lead, with researchers at the Royal Aircraft Establishment developing a process for manufacturing high-strength carbon fibres, reinforced with resin. Rolls-Royce started using carbon fibre composites to make components for its aircraft engines. However the material was found to shatter during bird strike tests. For a time, it fell out of favour, and by the early 1980s most of the expertise had moved overseas. When McLaren designer John Barnard came up with the idea of creating a carbon fibre racing car, he found little enthusiasm among the manufacturers. "We started going round to companies in Britain who were doing carbon fibre components like helicopter blades. They effectively said it's way too ambitious, we don't want to get involved," said Mr Bernard. McLaren eventually got its car built by an American firm, Hercules Aerospace. • 1879: Thomas Edison experiments with carbon filaments while developing the light bulb. • 1958: Union Carbide researcher Roger Bacon demonstrates high tensile strength carbon fibres. • 1963: UK Ministry of Defence patents a system for manufacturing carbon fibre. • 1991: Britain's last big carbon fibre maker, Courtaulds, ceases production. • 2007: Boeing unveils the Dreamliner - the first passenger aircraft built using mainly composite materials. John Barnard recalls the scepticism of other racing teams when news broke that McLaren had been experimenting with carbon fibre construction. Rivals referred to it as "black plastic" and feared that it would vaporise into carbon dust in the event of a crash. John Watson's accident at Monza put paid to those suspicions in an instant. On top of that, the lighter carbon fibre car was also winning races, including the 1981 British Grand Prix. Suddenly other F1 teams were left playing catch-up. Like couture fashion, ideas developed for the racetrack eventually trickle down to the High Street. Ultra-expensive road cars, such as McLaren's 1992 F1 were the first to make use of carbon fibre composites. Ferrari and Lamborghini followed suit. 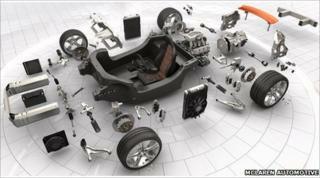 In 2011, McLaren will launch its latest carbon fibre-based road car, the MP4 12C. Yet for years, carbon fibre's use in affordable, mass-market vehicles has been largely limited to cosmetic embellishments - wrapped around gearsticks and petrol filler caps. One of the reasons big carmakers have been reluctant to use carbon fibre is uncertainty about the supply chain, according to Claudio Santoni, principal engineer at McLaren Automotive. "Whenever a big aerospace project comes along, carbon manufacturers run for it and they leave the small, niche automotive programmes with no fibres. "When the big manufacturers look at that, they are not going to risk their big programmes," said Mr Santoni. One such project, sucking up carbon fibre, is Boeing's 787 Dreamliner, which is mainly constructed from composite materials. Each plane uses approximately 35 tonnes of carbon fibre reinforced plastic (CFRP). To date, more than 800 aircraft have been ordered. Other reasons that the automotive industry may be cautious include the higher cost of carbon fibre and complexity of the manufacturing process, compared to aluminium or steel. Experts say these issues would eventually diminish as widespread uptake creates a virtuous cycle, refining manufacturing processes and driving down costs. It seems that message may be getting though. One of the first major manufacturers looking to take the plunge is BMW. The luxury carmaker has announced plans to build a range of electric city cars, under the sub-brand BMW-i, using lightweight carbon fibre passenger cabins. The company has entered a partnership with German-based SGL Carbon, and together the firms plan to build a $100m (£62m) carbon fibre manufacturing plant in Washington state in the US. The project should help eliminate the element of uncertainty from the supply chain, according to BMW, while delivering carbon fibre specifically designed for mass-produced road cars. In a move that took BMW executives by surprise, its rival VW recently scooped an 8% share in SGL Carbon. VW has unveiled its own prototype carbon fibre car, the L1, suggesting that the company also sees a viable future for composite materials. Not to be left behind, Audi and Mercedez-Benz have formed alliances with another German carbon fibre composite manufacturer, Voith. Image caption BMW plans to use carbon fibre composites for the passenger cabins of its i-series electric cars. One issue that the auto industry will need to tackle is carbon fibre's environmental impact. Processes for manufacturing the material have moved faster than those for recycling it. Although composite materials themselves are extremely durable, the shorter lifespan of other car components means that vehicles built using carbon fibre will, at some point, reach the end of their useful life. Many current recycling techniques weaken the fibres, reducing their usefulness. Researchers, including a team from the University of Nottingham, have begun to develop ways of separating composites into fibres and resin without degrading the product. Just as the makers of high-end sports cars turned to carbon fibre composites to find a competitive edge, the main driver for mass production vehicles is likely to be financial. Soaring oil prices have left motorists demanding more economical vehicles, and carting round heavy steel or aluminium costs money. "In order to improve efficiency in anything, you've got to make it lighter," said McLaren's John Barnard. "Light weight is a no-brainer in terms of return, and the only way I know how to make things lighter is to use another material. That material is carbon fibre. "That's the conclusion I came to 30 years ago," said Mr Barnard.